Outstanding' and 'A credit to the ibis brand' according to one happy reviewer, ibis Stevenage Centre is run with meticulous attention to detail so that your stay has all boxes ticked from check-in to check-out (which isn't until noon, which we think you'll appreciate). Wake up feeling refreshed after a snooze in your king-sized bed, hop into your huge en suite shower for an invigorating blast, then head down to the restaurant for a warm welcome and your perfect breakfast - however you define it! A friendly hotel in central Stevenage with a lounge bar and breakfast includedRight in the town centre, Holiday Inn Express® Stevenage hotel is less than a mile from Stevenage station.A direct train will whisk you into central London in around half an hour, or you can drive via the nearby A1(M). Flights at London Luton Airport (LTN) are only 15 miles away. Here on business? You're a quick walk from Gordon Craig Theatre, a popular conference venue, or you can hold a seminar for up to 30 in our 4 meeting rooms. Keen golfers are within reach of 2 golf courses, and Stevenage Leisure Park has a cinema, a health club and a trampoline park. The whole family can go sailing or explore the woods at nearby Fairlands Valley Park. You can walk to Westgate Shopping Centre, or take a leisurely drive to admire the Norman cathedral in St. Albans.At this hotel you can enjoy:- Free WiFi- Adjustable heating and air conditioning- Rooms with sofa beds for familiesKick start the day with our inclusive Express Start™ Breakfast, including scrambled eggs, baked beans, sausages and continental items. Sip drinks in the inviting lounge bar or grab a pizza from our snack menu, available around the clock. Our Next Generation bedrooms have quality bedding and executive desks, creating a cosy haven where you can work or just relax. Novotel Stevenage is an ideal base for exploring Stevenage and Hertfordshire. The 4-star hotel is conveniently located just off Junction 7 of the A1 (M) and is set among the tranquil grounds of Knebworth House. Ideal for both leisure and business guests, the hotel was completely refurbished in 2016 and features 102 modern, spacious rooms. Away from the hotel, guests can enjoy a day out at nearby tourist attractions, including Hatfield House, Warner Bros. Studio Tour & Paradise Wildlife Park. 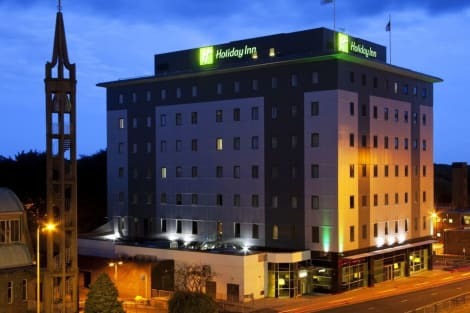 A welcoming Stevenage hotel near the train station, with a restaurant and a conference floorRight in the town centre, Holiday Inn® Stevenage hotel is moments away from the A1(M) motorway.On-site parking is available, and it’s a 25-minute drive to London Luton Airport (LTN). Business guests can host events in 8 fully equipped rooms on the hotel's dedicated conference floor, including a suite for up to 400 delegates. For even bigger functions, Stevenage Arts and Leisure Centre hosts conferences just a short walk away. Westgate Shopping Centre and Stevenage Leisure Park are also within walking distance of the hotel. Travelling with kids? You can explore the woods or go sailing at Fairlands Valley Park, a short drive away. St. Albans' Norman cathedral is a 25-minute drive from the hotel, while Harry Potter fans can take the Warner Bros. 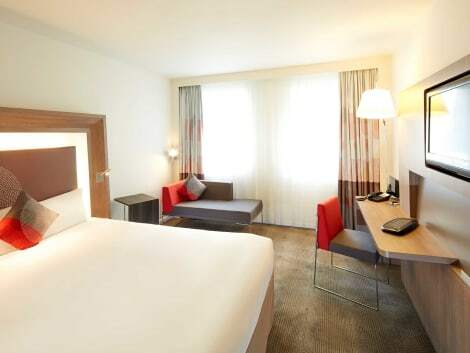 Studio Tour London, 35 minutes away by car.At this hotel you can enjoy:- Free WiFi throughout- On-site parking at a daily rate- Kids stay and eat freeGuest rooms feature comfy beds and a choice of pillows to ensure a good night's sleep. Start your day with an energising workout in the mini gym and a full English breakfast buffet in Destinations Restaurant. You can enjoy international dishes for lunch and dinner, or grab a snack and relax watching Sky and BT Sports over beers in the bar. Take in the views from a terrace and a garden and make use of amenities such as complimentary wireless Internet access. Additional features at this hotel include wedding services, a television in a common area, and discounted use of a nearby fitness facility. Grab a bite to eat at Nirvana, a restaurant which features a bar, or stay in and take advantage of the room service (during limited hours). Stevenage is an attractive town in Hertfordshire, and just half an hour from the centre of London. Book a Stevenage hotel with us and discover a borough redolent with history and gorgeous buildings. Decreed as a New Town in 1946, Stevenage has a history that goes back over thousands of years. Stevenage Museum contains more than 30,000 artefacts and photographs charting the town's timeline. From the early settlers of Roman times and the impact of the Industrial Revolution to the town's part in WWII and beyond, there is much to see. You'll even find fossils dating back to the Stone Age, as well as Roman coins and agricultural exhibits. Just three miles south of Stevenage is one of the country's most celebrated stately homes, Knebworth House. The original property was built in 1490 as a red-brick Late Gothic manor house but was remodelled circa 1913 in its present Tudor Gothic style. Tour the house and the grand gardens, and try not to lose yourself in the maze. Kids will love the extensive adventure playground. For a taste of Jacobean splendour Hatfield House, 11 miles south of Stevenage, is well worth a visit. You'll find much to admire including historical paintings, suits of armour and the legacies of many bygone kings and queens. The beautiful 42-acre gardens have been restored to their early 17th-century glory and include an adorable foot maze, as well as fountains, orchards, herb gardens and scented plants. Two fun ventures in the town are perfect for keeping the kids busy. Partyman World of Play and 360 Softplay are both packed with activities designed to entertain and exercise the young ones in safe environments. And the Gordon Craig Theatre is a 501-seat venue which hosts stand-up comedy, live music acts and plays. Gangnam is a Korean restaurant that is cooking up a storm in Stevenage. Choose from a starter of, say, pickled vegeSEOSITE_LEVEL_DESCRIPTIONs to a main course of rib stew. It doesn't serve alcohol but you're welcome to take your own. A family-run fish and chip shop, Cox's is generally thought to be the best of its kind in the area and they also serve gluten-free food and a nice cup of tea. Offering a range of specialist real ales, Our Mutual Friend is a CAMRA award-winning pub that supports local brewers, stocks traditional cider and perry and serves pub grub. The Mutual (as it's known locally) puts on theme nights every now and then and hosts beer festivals four times a year. The High Street is populated with charming old buildings and quirky independent shops. You'll find plenty of supermarkets in Stevenage for essentials and the Westgate Shopping Centre has more than 30 big-name stores. And if that's not enough, the town is also home to two retail parks, Roaring Meg and Monkswood.